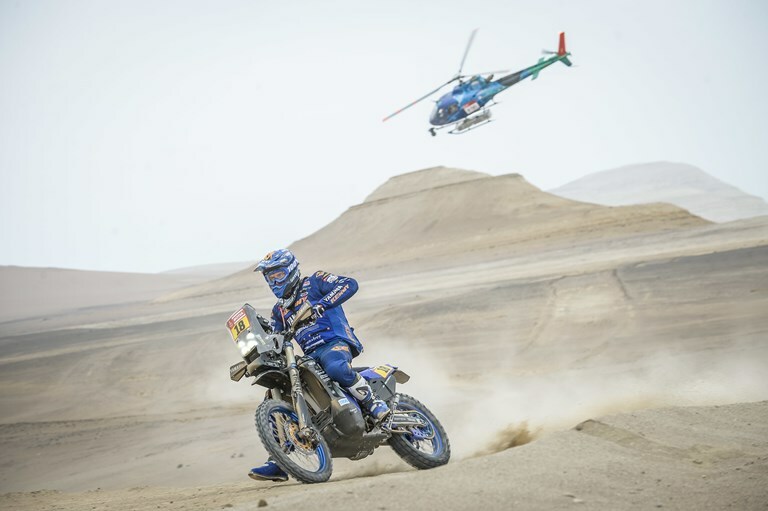 Stage nine of this year’s Dakar brought mixed emotions to the Yamalube Yamaha Rally crew. With Xavier de Soultrait putting in another solid stage performance to secure a spot inside the top five in the provisional overall standings, Adrien Van Beveren lost more than three hours battling with a small technical issue and was unable to finish the stage. Enjoying a good feeling aboard his Yamaha, Xavier de Soultrait was able to control his pace on Wednesday. Posting the 10th fastest time for the day, he moved up to fifth in the provisional overall standings. Less than eight minutes behind the rider in fourth, Xavier will do his best to move up higher in the overall during Thursday’s final stage. Adrien Van Beveren started the day determined to battle for the stage victory. Enjoying a faultless performance for the greater part of the stage, Adrien was just one second behind the day’s eventual winner at the fifth and final waypoint. Suffering a small technical issue 16km before the end of the stage, the Frenchman was left with a mountain to climb. Putting in a heroic effort, he battled through the issue for hours but was not able to cross the finish line. Featuring a short 112km timed special, the 10th stage of the 2019 Dakar Rally will take competitors back to the city of Lima. It will be the last part of this gruelling two-week adventure in Peru.